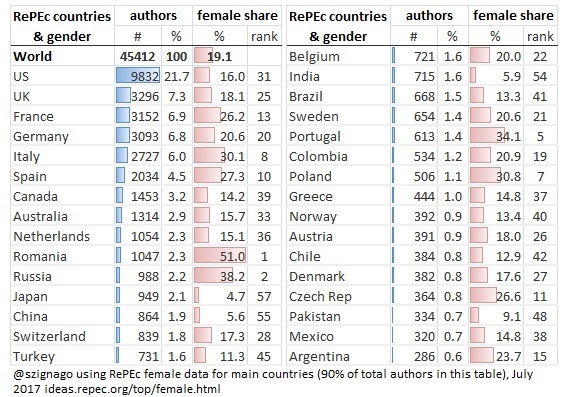 Thanks to the ranking of female authors in RePEc, we have long known the share of women in the RePEc sample of more than 50K authors: 19%. 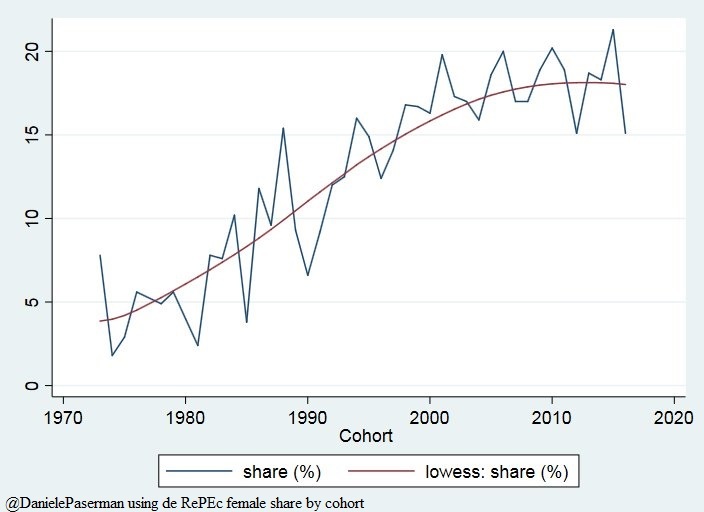 We now know also the shares of women economists by country, US state, field of study and PhD cohort. The following table shows for the largest countries their relative size and the proportion of women in each. European countries are doing better than the world average, especially Latin and Eastern European countries, while Anglo-Saxons are the most masculine (is it that relatively higher salaries for the profession in Anglo-Saxon universities attract the most competitive men?). Latin America is generally below average (except for Colombia and Argentina) while Asia has very low shaes of female economists, with less than 6% in Japan, China and India, and 9% in Pakistan (you can sort by column in the link). The figures by cohort year of doctoral students in economics do not allow much optimism for the future, as shown in the graph below. In terms of fields of study, women are more present than before in all disciplines, but there are more masculine fields than others: finance (10.9% of women), time series (11.4%), sports economics (12.2%)… The most feminine: demography (37.7%), tourism (34%), Eastern economies (33.4%, likely due to the higher share of females in those countries). 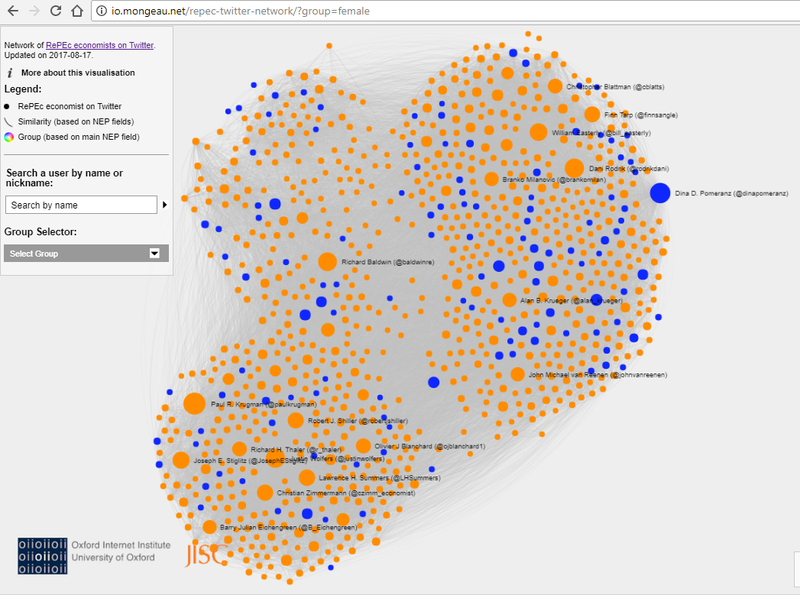 IDEAS also lists the RePEc economists active on Twitter (over 1000 registered). 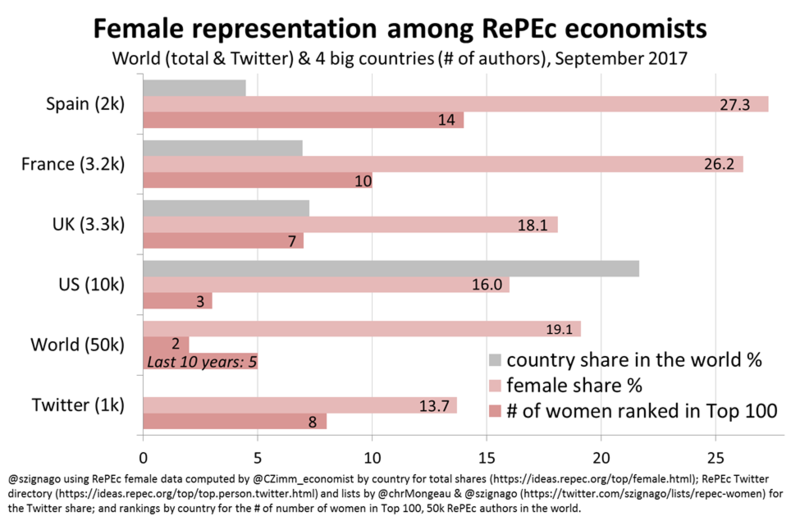 While women represent 19% of the RePEc authors, they are only 14% in the Twitter subsample. Looking at the Top 25% of this list of RePEc/Twitter economists by number of followers (3rd row), the proportion of women falls to less than 13%. In fact, the total audience of these women among the top 25% is a little over 3%. The table also provides the names of the most followed female economists on Twitter: only eight are ranked among the top 100. The lack of women at the top is also apparent in the rankings based on the quality of publications and citations that RePEc releases: only two appear among the world’s top 100, Carmen Reinhart and since recently Asli Demirguc-Kunt. The following figure gives some statistics about the top economists in some of the countries with the most registered economists. Again, European countries outperform Anglo-Saxon ones in terms of women among the top 100. There is a lot of literature documenting this gender bias in the economics profession. These latest RePEc data complement what is well known, allowing international, thematic and temporal comparisons. See also the nice interactive representation of the RePEc network that Christian Mongeau makes by gender. RePEc is all about the free dissemination of economic research, but for many economists it is most known for its rankings. While would really emphasize that the rankings are only a by-product and to some degree a motivator for people and publishers to have their works listed on RePEc, we want to acknowledge that the rankings have become important, as they are use for evaluations in funding agencies and for promotion or tenure. So here are some recommendations on how to optimize rankings, both for authors and institutions. Foremost, make sure your profile is current. Go to RePEc Author Service and log in. Click on research to see whether the system has found any suggestions. Make sure you have all the relevant name variations for you so that it can make the best suggestions. Check also if the system needs some help in attributing some citations. A few publishers still do not participate, particularly among book publishers. Encourage yours to index its works in RePEc. If you have advised graduate students and they are registered in RePEc, add them to your RePEc Genealogy record. Help your own advisor’s record as well. This is likely the lowest hanging fruit for many economists. RePEc sometimes fails to find the bibliography for some articles. If this makes you miss some citations, you can help by uploading those references. The full bibliography is required. The input form is here. Working papers get downloaded many more times than journal articles. Thus make sure to have them listed! Your institution can have its WP series indexed following these instructions. If that does not work out, upload them to MPRA. Most publishers allow it, as long as it is not the final version. See details at SHERAP/RoMEO. Finally, link to your profile on IDEAS or EconPapers from your webpage. Foremost, make sure that all members of your institution are registered at the RePEc Author Service. You can look up who is already there by finding your record at EDIRC. Note that if someone is listed with a question mark, it means their email address is not valid, and they will not count towards your score. Please get it corrected (or tell us about the new address or whether this person may have died. It happens). If you have a graduate program, you want to have the graduates listed in the RePEc Genealogy. Your EDIRC record also lists who is already linked. There is already a ranking using these records. If you have a working paper series or some other serial, make sure it is indexed in RePEc. Instructions. Of course, have your members follow the recommendations for authors above. A graduating economics PhD or doctoral student who is looking for a job in academia or policy circles is typically doing so with a “job market paper.” The JMP is the one that many recommendation letters from faculty focus on, it is the one that is mostly talked about in job interviews, and it is presented during campus visits. It is thus fair to say that the JMP is the best this student has done so far, and a lot of effort goes into this paper. Shouldn’t this work then be more widely disseminated than a few recruiting committees? We are thus introducing the Job Market Paper archive on RePEc. Job candidates can upload their paper, which gets the standards treatment of any new working paper in RePEc: it gets listed on the many services using RePEc data, including the websites EconPapers and IDEAS, as well as the email notification service NEP. In addition, the papers are hosted by a RePEc server for posterity. This is important, as job market candidates tend to find jobs and often move their web page as a consequence, resulting in broken links. Finally, the presence of the papers in this series clearly identifies the author as a new economist one may want to look at for a hire. Recruiters can simply follow what is new in this archive. As expected, certain restrictions apply. To learn more, see here. Note for that for those who are not on the job market and do not have access to a local working paper series that participates in RePEc (instructions), MPRA is still available. This letter calls attention a recent trend in economics publishing that seems to have slipped under the radar: large increases in submissions rates across a wide range of economics journals and steeply declining acceptance rates as a consequence. It is argued that this is bad for scholarly communication, bad for economics as a science, and imposes significant and wasteful costs on editors, referees. authors. and especially young people trying to establish themselves in the profession. It is further argued that the new “Big Deal” business model used by commercial publishers is primarily responsible for this situation. Finally it is argued that this presents a compelling reason to take advantage of new technologies to take control of certifying and distributing research away from commercial publishers and return it to scholarly community. The purpose of academic journals is to facilitate scholarly communication, filter for errors, and maintain the record of scientific advance. I seldom actually read journals any more. I research topics using Google Scholar, RePEc, SSRN, and so on. It is inconvenient to sign up with publishers to get tables of contents emailed to me or to login to my university’s library web portal to search a journal issue by issue. I find it adds very little value over a more general search in any event. In short, certification remains important to help people gain tenure and promotion and to get a sense of the quality and centrality of individual scholars. However, neither certification by a journal, nor the collection of similar papers within the bound or even electronic pages of a specific journal has very much meaning to me when I am trying to understand where the debate in a subfield is at any given moment. As a result, I was beginning to come to the conclusion that while they are irritating, commercial publishers are “mostly harmless” to the research enterprise itself as publishing itself is becoming mostly irrelevant. This coincides with my own observation: researchers don’t need journals. The main purpose of the journals is currently to ease the work of hiring committees. People publish in order to get a job. The wish to communicate new findings appears secondary in most cases. Journals could serve worthier aims, however: they are needed by students, college teachers, and others who would like to obtain reliable information but can not as easily separate the wheat from the chaff as active researchers can. bad for scholarly communication, bad for economics as a science, and imposes significant and wasteful costs on editors, referees. authors. and especially young people trying to establish themselves in the profession. I fear, however, that John Conley’s suggestion to increase the number of journals would not improve the situation very much. As long as hiring committees use the reputation of journals, rather than the reputation of individuals, a useful system of “communication, filter for errors, and maintain the record of scientific advance” is practically blocked. What can be done besides increasing the number of journals? Here some further suggestions. 2. Hiring committees that feel incompetent to judge the substantive quality of a contribution and have to resort to statistics of some sort may turn to citation counts of individual authors, as obtainable through Google Scholar, Web of Science, or RePEc). This is a better solution than the the current practice of relying on the prestige of journals and would take account of the fact that many papers in top journals are not so good, and medium-quality journals publish excellent articles. You are currently browsing the archives for the Economics Profession category.